Here at The Corning Museum of Glass (CMoG), it is common for Chinese visitors, after watching a Hot Glass Demonstration narrated in Mandarin, to give the “thumbs-up,” meaning “true Kung Fu” or “excellent Kung Fu.” One may wonder what the martial arts have to do with the art of glassmaking. In the Chinese-English dictionary , Kung Fu is defined as supreme skill from hard work. It refers to excellence achieved through long practice in any endeavor. A person who demonstrates extraordinary skill can be said to have Kung Fu. For instance: a poet, artist, athlete, translator, or even a glassmaker can possess Kung Fu. With more Chinese thumb-ups than our eyes can count, one wonders what kind of Kung Fu these Chinese tourists perceive that moves them to spread the good word about the Museum. Based on conversations with Chinese visitors, there are three things about a visit to CMoG that embody the Chinese perception of Kung Fu. The first CMoG Kung Fu is the Hot Glass Demos narrated in English and Mandarin. There is a significant Chinese presence among those who make the trip to the Museum. 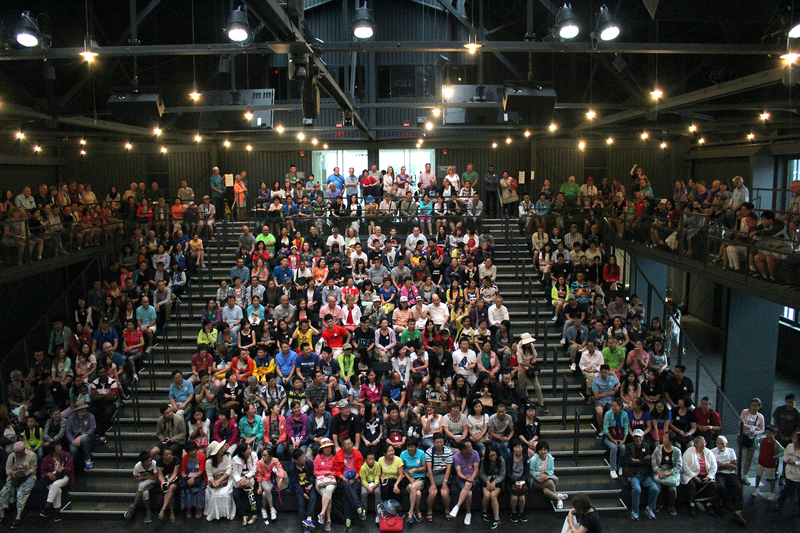 Each year about 30% of our visitors travel to the Museum by tour bus, and Chinese-speakers represent the majority. Chinese visitors who have experienced the Mandarin-narrated demos tend to develop much enthusiasm toward glass, and a stronger appreciation toward the Museum’s collections. A mostly Chinese audience watches a Hot Glass Demo. Tour operators have heard Chinese guests describe the experience this way: “It is not just like magic, but it is indeed magic!” Like many of our western visitors, Chinese visitors are impressed by the speed and skill of glassmakers’ ability to transform a molten glob of glass into an exquisite work of art. 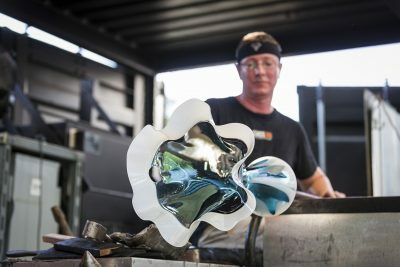 Other Chinese tourists say that the show, “is more than a demo, it is a learning experience.” Although such glassmaking demos likely occur elsewhere in the world, our Mandarin narration of the demo stands out among others in its value to Chinese tourists as a learning experience. 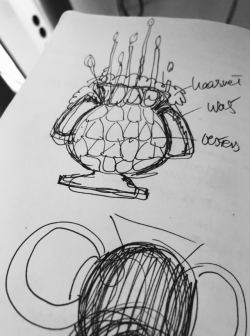 It is abundantly clear that, by unleashing the glassmakers’ Kung Fu and coupling that with Mandarin narration, the demo experience provided at the Museum is a one-stop way of learning an array of knowledge related to glass art, culture, history, techniques, science, and technology. Chinese visitors are amazed to see 3,500 years of glass. Some of the collection favorites are considered the highest embodiment of Kung Fu by Chinese tourists. Portrait of King Amenhotep II (? ), Egypt, 1426-1400 BC. Purchased in part with funds from the Museum Endowment Fund. 79.4.1. Bouquet of Flowers, Leopold Blaschka, Dresden, Germany, 1880-1890, 79.3.90. Window with Hudson River Landscape, Tiffany Studios, Corona, N.Y., 1905, © Louis Comfort Tiffany. 76.4.22. For example, Bouquet of Flowers by Leopold Blaschka almost always elicits this response: “I cannot believe that they are not real!” In the opinion of Chinese visitors, the Museum’s collection is too precious to miss. While the Museum’s collection is inspiring, the Innovation Center is a must-see gallery for Chinese visitors. Corning is known to many Chinese as a global leader in glass science and technology. For instance, many Chinese know that Corning Inc. invented and developed Corning® Gorilla® Glass which is used for the screens of smartphones and tablets. 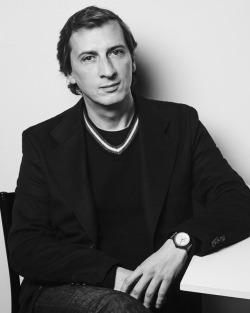 To many Chinese, glass innovation and Corning glass are synonymous. It is common to receive questions from Chinese visitors about glass terms, like Corning Gorilla Glass, optical fiber, and tempered glass. 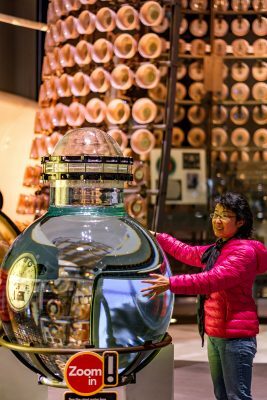 That the Museum presents science and technology as well as history and culture, differentiates us from other locations that Chinese tourists visit, making CMoG a special place to visit. 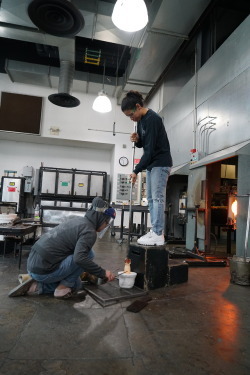 Chinese visitors who are moved by the Kung Fu at Hot Glass Demos — molten glass transformed into more familiar objects — then marvel at the glass in our galleries. They are not just seeing the glass as objects, but “feeling” the glassworks with a stronger sense of curiosity. A quote often attributed to American poet Maya Angelou says: “I’ve learned that people will forget what you said, people will forget what you did, but people will never forget how you made them feel.” With petabytes of data in the form of pictures being sent to Chinese users back home via social media platforms such as WeChat , Chinese visitors may encourage their fellow citizens to visit CMoG and to experience the Kung Fu that is expressed by the many artists and artworks at the Museum. After visiting the Museum, the aesthetic and artistic beauty Chinese visitors contemplate ensure that they will always remember how the Museum made them feel. Hsiao-Ying Tiao Shih is the Mandarin Narrator/Interpreter Team Leader for Hot Glass Programs and Events at The Corning Museum of Glass. Hello, Hsiao-Ying, hope this find you well.